Here’s another tasty recipe from my last trip to Italy! More on my trip here. 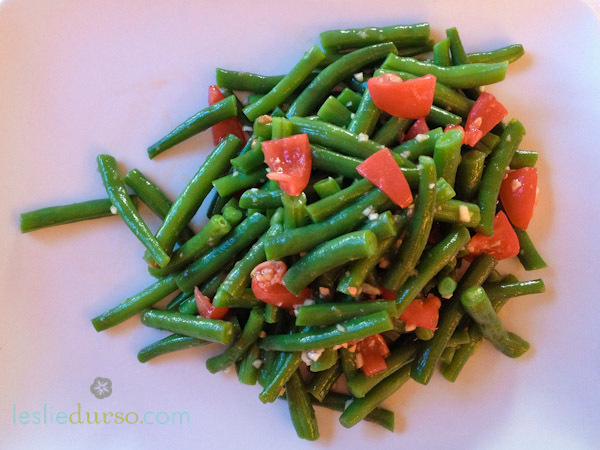 These green beans are fresh, tasty, and quick! They were part of a antipasti platter I had at the cutest little restaurant! This salad is awesome as is, but I think it could be even better with the addition of toasted almonds or olives! Steam the green beans in a large pot until they are fork tender. Immediately remove and drop in an ice bath. Remove and place on a towel. In a large mixing bowl, combine the garlic and a pinch of salt. Add the green beans and a couple tablespoons of olive oil and toss. Add in the tomatoes and toss gently. Serve cold or room temperature. It is in reality a nice and helpful piece of info. I am happy that you shared this useful information with us. Please keep us informed like this. Thanks for sharing.